Any person who spends a significant time around the game of basketball knows how often the importance of shot selection is preached. But what is it that makes shot selection so important? To a certain level, it is intuitive: teams that are able to create good shots are more likely to make those shots. However, it is hard to quantify both what shot selection actually is, and also how to measure the extent to which a team or player has “good” shot selection. 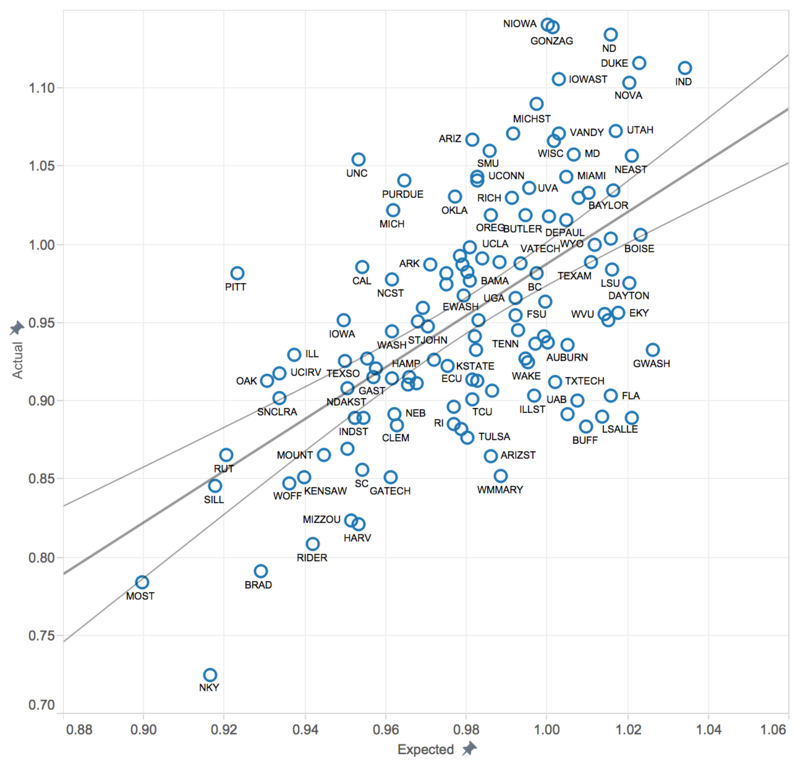 In the NBA, with the wealth of data available, many factors can be considered, like distance of nearest defender. However, that luxury is not as widely available in the NCAA. Thus, the best way we can look at shot selection is by looking at where shots come from on the court. With the help of data from CBS Sports’ website, we compiled a database of over 1100 games and 120,000 shots ranging from the beginning of the ‘14-15 NCAA season to the end of the 2015 calendar year, which amounts to the approximate end of non-conference play from this season. By looking at every shot and the result of it, we can assign an expected points value for each coordinate on the court, and use that to evaluate shot selection across college basketball. 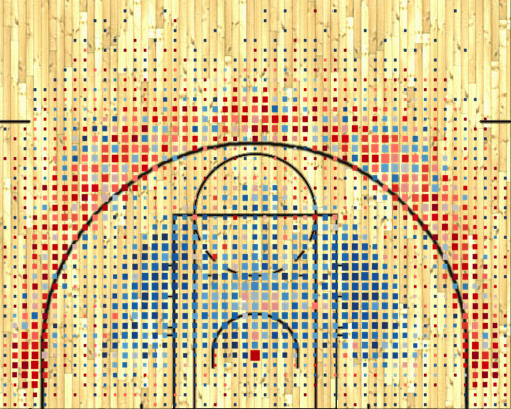 Above, you can see a diagram of shot efficiency from different areas on the court, where the red areas are the most efficient and blue the least efficient, while the size of the square represents the frequency of shots coming from that location. One thing to note is that CBS groups all layups to one coordinate (the big red square by the hoop), which is why it may seem as though there is too much blue around the hoop. However, the efficiency of layups is indeed captured. 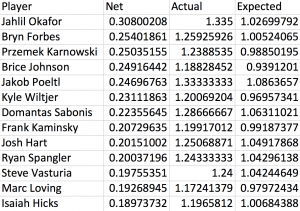 Once an expected points value is available for every coordinate, we can then go through player by player and find the expected points of every shot they have taken, and then average these values to find what kinds of shots they are taking as a whole. In order to avoid outliers, it is limited to players with over 200 shots. Looking at the top of this category, there tends to be a wide range of type of player. 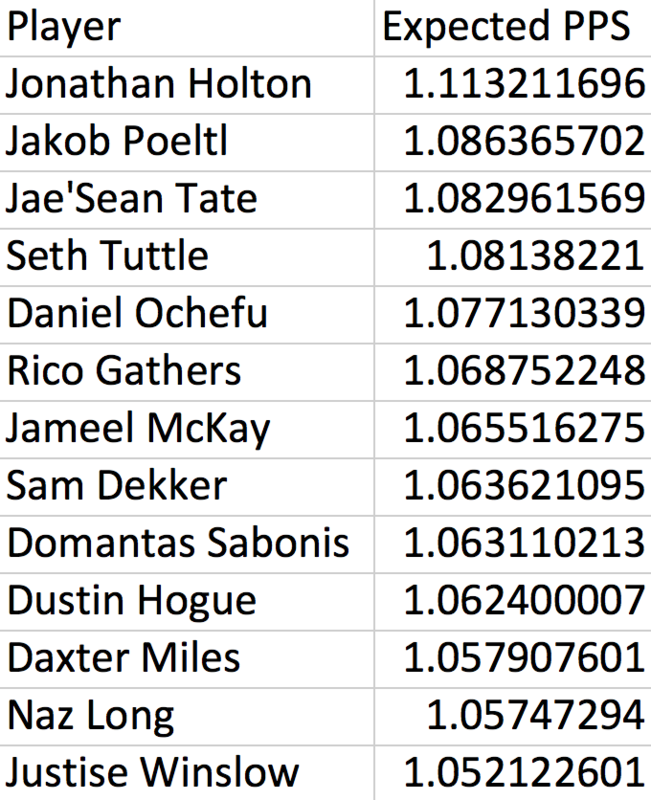 With the 3 point revolution currently going on in the NBA (and all across the game of basketball), spurred on by the growth of analytics, you would expect that this list would be filled with 3 point specialists. Yet, judging from the numbers that is not the case. While there are guys on the list who have range out to beyond the arc, there seems to be more of a presence from bigs who get most of their shots right around the restricted area. 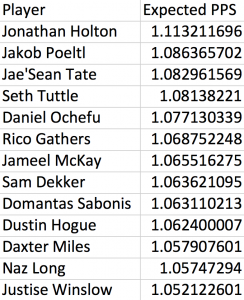 Overall, it seems to be generally a combination of the aforementioned bigs along with small forwards who like to slash to the hoop a fair amount making up most of the leaderboard. What does this tell us? Well, to a degree Marc Jackson had a point in his criticism of Stephen Curry and his effect on the game. The one in a million talents like Curry may have the ability to take 3’s and make them consistently at an extremely efficient clip. However, in the college game at least, the players who are more aggressive at trying to get efficient looks at the hoop are actually giving themselves the best chance to score. The 3 is certainly a more efficient shot than the midrange jumper, but people are beginning to forget the fact that even the 3 will never match the efficiency of a layup. As for applying this metric to full teams, some of the notable programs near the top do tend to be teams with a heavy emphasis on 3-point shooting, like Duke and Villanova. On the other end of the spectrum, teams near the bottom like Pitt and Illinois generally tend to have more of an emphasis on post play and the midrange game. So, what is the difference between individuals and teams? For one, though certain players at certain positions may be able to get almost all of their shots at the rim, it is almost impossible for a whole team to do so consistently. Thus, when faced with having to find a secondary option for scoring, the 3 will almost always prove the wiser option than the post or midrange game. 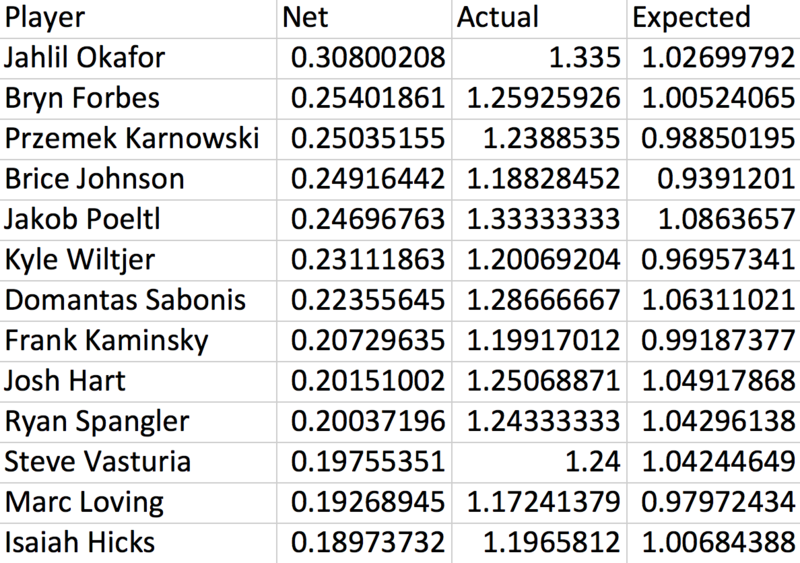 While shot selection is certainly important, it is also interesting to look at the players who outperform their expected points average the most, which is essentially the players best able to make shots most other players can’t make. Interestingly enough, the top player in this category also happened to be the #3 pick in this year’s NBA Draft, Jahlil Okafor. Some other notables follow closely behind in the top ten, including All-America candidates Brice Johnson, Jakob Poeltl, Kyle Wiltjer, and another top ten NBA pick in Frank Kaminsky. One other thing that stands out is that three of the top eight all happen to be from Gonzaga, which makes it seem as though offensive system may have some sort of effect on this category. 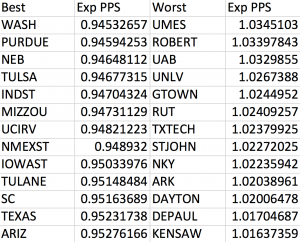 Not surprisingly, when looking at teams as a whole, Gonzaga is right near the top in outperforming their expected points, behind only Northern Iowa. As expected, this is the category where there tends to be the strongest divide between the perennial powerhouses of college basketball and the smaller programs, which makes sense because of their ability to bring in the top recruits year after year. When looking at expected points and actual scoring together, it becomes clear why shot selection is so greatly stressed throughout the game. There is a strong correlation between teams that take high percentage looks and teams that convert at an efficient clip, just as one would expect. While some teams like UNC have the ability to take tough looks and still score at a decent efficiency, the fact remains that teams that take better shots tend to be more successful. There will always be exceptions to the rule (see Curry, Stephen), but it does not change the fact that the importance of working to get high percentage looks cannot be understated. This whole concept holds even more importance on the defensive end. Unlike on offense, the defense has no control over whether the opponent makes a shot, rather they just have the ability to try and make it as tough of a shot as possible. Thus, looking at teams that are able to force tough shots for opponents is a great way to measure the effectiveness of a team’s defensive performance. Without player tracking, we cannot look at how close the defenders were, but given what is available, seeing from where shots come can certainly shed some light on the premier defensive teams in college basketball. 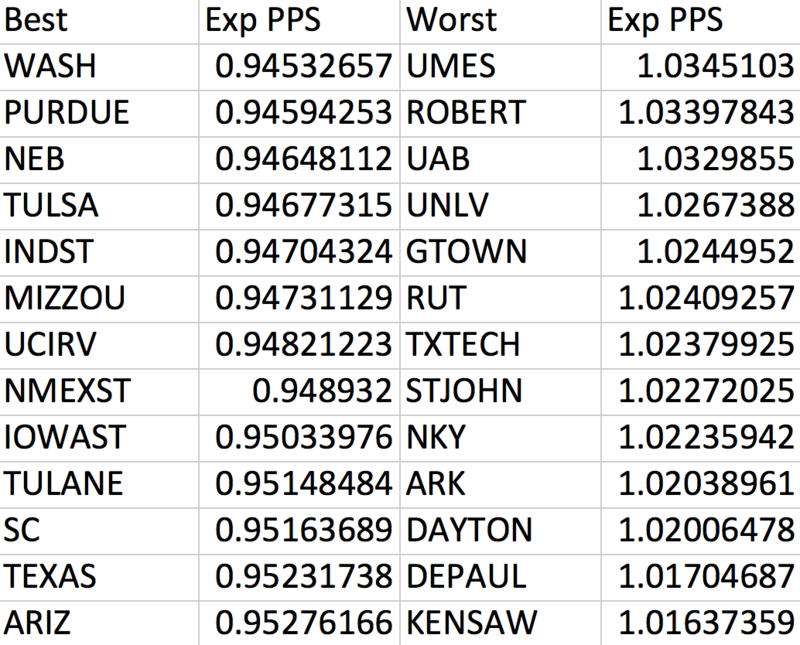 Looking at the data, teams like Purdue, who pride themselves on being smart players who leave their heart out on the court every night, tend to be at the top, while underperforming programs like St. John’s find themselves struggling to force tough shots for their opponents. While it certainly doesn’t hurt to also have two 7-foot rim protectors like AJ Hammons and Isaac Haas, as athleticism certainly plays a significant role on defense, you can see in the data that it takes more than one or two guys with freakish athleticism to make it tough for opponents on the defensive end. Looking at some of the teams near the top, it becomes clear just how big of a role effort and grit play in whether or not teams are able to get stops on the defensive end. While on the offensive end there are numerous different stats to evaluate teams, there has never been much to evaluate defense objectively, other than simple stats like points allowed. However, in no way does that account for whether an opponent just happens to have either a good or a bad night. Looking at shot selection allowed gives a whole new perspective on how to evaluate team defensive performance. By no means does shot selection tell the whole story when referring to either offensive or defensive performance. However, given the current state of data available in NCAA sports, it adds a whole new dimension to the traditional box score.